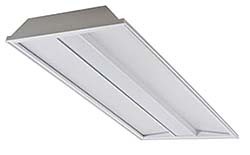 AR Series LED Architectural troffer offers efficacy of 100 lumens per watt and has a designed lifetime of 75,000 hours, according to the company. It supports dimming down to 5 percent with industry standard 0-10V controls. Comes in 2-by-2-foot, 3,200-lumen and 2-by-4-foot, 4,000-lumen models with color temperatures of 3500K and 4000K.